Get Veet Ready-to-use Wax Strips Free Sample of Full Body Waxing Kit. 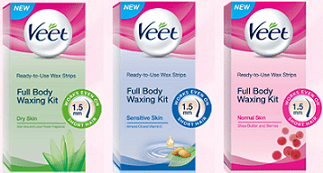 Veet India is back again with free sample of their Full Body Waxing Kit. This Veet Wax Strips free sample is valid for Delhi-NCR only. 2. Fill up the form Or give missed call on +91 90161 90161. 3. Simply fill out your details to receive Veet Ready-to-use Wax Strips Free Sample. 1. Veet Ready-to-use Wax Strips Free Sample can also be requested by giving a missed call on +91 90161 90161 . 4. Sample requests is open for residents of Delhi, Faridabad, Gurgaon, Noida and Ghaziabad only. Veet Ready-to-Use Wax Strips Full Body Waxing Kit contains 20 wax strips and 5 perfect finish wipes. It is enough for a one time depilation of full arms, full legs, underarms and bikini line. So enjoy the Veet Ready-to-use Wax Strips Free Sample. They’re so easy to use: Just 5 easy steps are all that it takes to get that perfectly waxed, smooth skin result any time. Since each skin type is unique, the Veet Wax Strips Full Body Waxing Kit comes in three different variants, specially formulated with ingredients that take special care for your skin type. It comes for normal, dry and sensitive skin. It takes only a few seconds to rub the wax strips between your hands to warm the wax, place it on your skin and pull it back on itself very quickly. Each strip has been carefully chosen to leave you feeling pampered and ready for anything.